Among the early steamships serving the famed Cunard Line on the North Atlantic was the Abyssinia, one of a trilogy of ships built for the company in or about 1870. The sister ships were the Algeria and the Parthia. In its day, the Abyssinia was a formidable ship, constructed on an iron hull and measuring a remarkable 363.5 feet in length. She boasted accommodations for 120 first class passengers and could cram another 1,068 people in steerage. These were the common people, many of them migrants making their way to America from Europe. Passenger ships, even in the years before the great wars, were considered arms of the military because of their capability of moving large numbers of troops to any port in the world. And England was a mighty empire in the 1800's with interests on every continent. It was said the sun never set on the British Crown colonies. Thus it was significant that the Abyssinia had the capability of transporting up to two battalions of soldiers on demand. While she was built before the days of building luxury accommodations and elaborate dining rooms and dance floors in an elegant superstructure above the main deck, the Abyssinia offered luxury for the first class passengers. It was said it was among the first passenger liners to offer numerous public restrooms, and they were located on both sides of the ship. People who used them remarked about the advantages of always choosing the toilet on the leeward, or downwind side of the ship for obvious reasons. The ship also boasted male and female hospitals, a distilling apparatus that could produce up to 2,000 gallons of fresh water daily, holds for up to 80,000 cubic feet of cargo and 1,200 tons of coal. She also had three masts equipped to take sail in the event of engine failure. 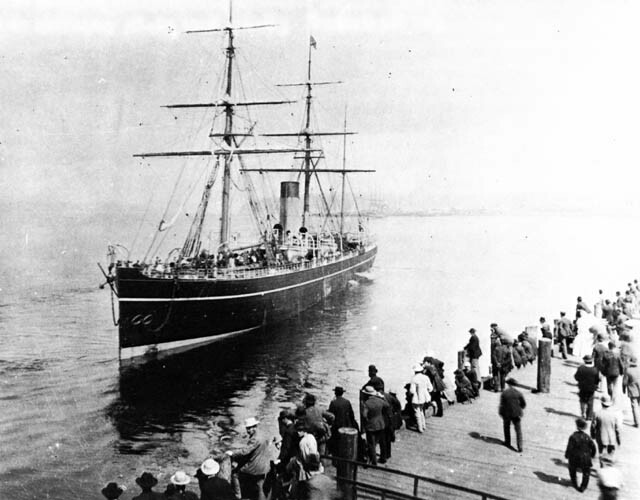 The Abyssinia made its maiden voyage from Liverpool to New York in May, 1870, and continued on that run with uneventful regularity for the next ten years. Then in 1880 the ship was acquired by her builders, the J & G. Thomson & Co. of Glasgow as partial payment for two new ships, the Servia and Catalonia. It was then sold to the Guion Line, which installed new compound engines and put the steamer in service on a Canadian-Pacific run. It carried passengers and freight from Vancouver to Hong Kong and Japan. The line brought Abyssinia back to New York in November, 1891, with plans to return her to its old run between New York and Liverpool. On her first trip, however, the ship caught fire at sea on Dec. 18 and burned to destruction. The only written account of that fire was found in a report on the German steamship Spree that came upon the burning Abyssinia on the open Atlantic and saw that passengers and crew were in the process of abandoning ship. The Spree launched her own boats and rescued the full complement of 60 passengers and 88 crew members from the burning ship. The Abyssinia burned to a total loss and sank at sea.